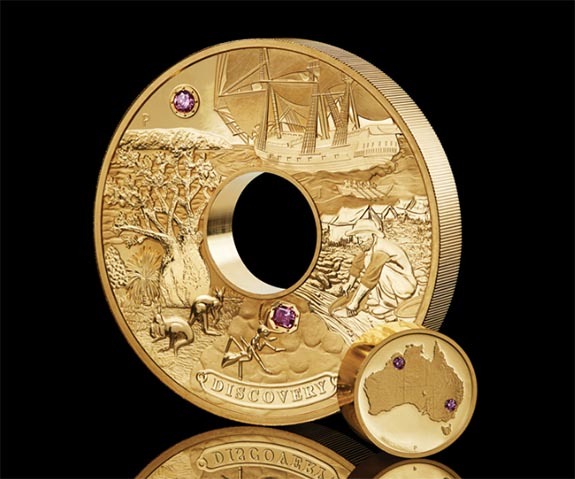 Inspired by the "holey dollar," Australia's first official currency, The Perth Mint recently unveiled a $1.7 million collector coin that pays tribute to early prospectors of the nation’s most treasured natural riches — gold and pink diamonds. 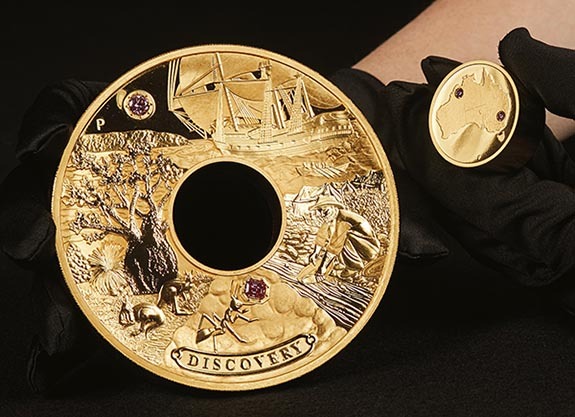 The Discovery coin weighs 2,000 grams (4.41 pounds) and has an unusual design reminiscent of a donut and a donut hole. In this case, the outer ring of the 99.99% pure gold coin weighs 1,800 grams and has a face value of $9,000 AUD. The inner punch weighs 200 grams and has a face value of $1,000 AUD. The "holey dollar," which was introduced as Australia's first official currency in 1814, was also a two-part coin. The outer ring was worth five shillings and the inner punch was worth one shilling. The Discovery coin is set with four pink diamonds from the Argyle Diamond Mine of Australia's Kimberley region. The two larger stones are part of the Argyle Pink Diamond Signature Tender: One is a brilliant-cut 0.88-carat Fancy Intense Purplish Pink and the other is a 1.02-carat emerald cut Fancy Vivid Purplish Pink. The smaller stones weigh 0.08 carats each and are rated Fancy Intense Vivid Pink. Every facet of the coin's design is symbolic of the destiny and fortune pursued by early prospectors in their relentless search of gold and diamonds. Discovery's outer coin features a sailing ship and rowboat ferrying hopeful diggers ashore, while a 19th century prospector pans for gold in front of miners' tents. Adjacent is a vista of where pink diamonds were found. The Kimberley region is depicted by an iconic boab tree and kangaroos, with a brilliant-cut pink diamond representing the tropical sun. Legend states that the first glimpse of one of these rare pink prizes glinted from the soil of an anthill, so the scene on the coin portrays a worker ant on a mound of earth with an emerald-cut pink diamond clasped between its mandibles. The heart of the coin shows a stylized image of Australia with the two smaller pink diamonds marking the location of Ophir in the southeast, where gold was first found, and the Argyle Diamond Mine in the northwest. The width of the outer coin is 100.6 mm or 3.96 inches (about the width of a softball), while the inner punch measures 32.5 mm or 1.28 inches wide (similar in size to a Kennedy half dollar). The thickness of the coin is 15.5 mm (0.61 inches). "The coin showcases rare pink stones handset in the most famed of precious metals, telling the inspirational rags-to-riches tales of mining for these prized resources," said Perth Mint Chief Executive Officer Richard Hayes. The one-of-a-kind coin was issued as legal tender of Australia. The obverse of each coin displays the Ian Rank Broadley effigy of Her Majesty Queen Elizabeth II, the monetary denomination and the year 2018. The coin will be on display at The Perth Mint Shop until September 28, 2018, unless it is sold earlier. Credit: Images courtesy of The Perth Mint.